Western blot: 1/100 - 1/500. 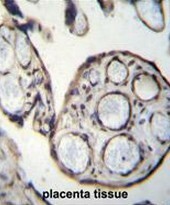 Immunohistochemistry on paraffin sections: 1/10 - 1/50. Calpains are ubiquitous, well-conserved family of calcium-dependent, cysteine proteases. The calpain proteins are heterodimers consisting of an invariant small subunit and variable large subunits. The large subunit possesses a cysteine protease domain, and both subunits possess calcium-binding domains. Calpains have been implicated in neurodegenerative processes, as their activation can be triggered by calcium influx and oxidative stress. 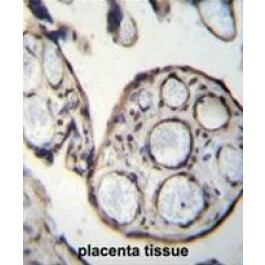 The protein encoded by this gene is highly expressed in the placenta. Its C-terminal region lacks any homology to the calmodulin-like domain of other calpains. The protein lacks critical active site residues and thus is suggested to be proteolytically inactive. The protein may play a role in tumor formation by inhibiting apoptosis and promoting angiogenesis. This antibody reacts to CAPN6.